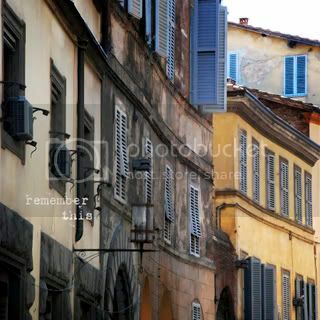 I am still plugging away on my Italy album. I had to take a couple of weeks' break and now I'm up to 28 pages (or 14 spreads). I just finished day four of the trip. Whew! I think I'll get to somewhere around 60 - 70 pages when I'm finished (so if someone happens to own Shutterfly, give me a heads up, ok). I am doing mostly multi photo pages but am trying to liven it up a little with some full bleed photos. So here is the second sneak peek, also a full bleed. The photo was taken in Siena. I made the word art, which by the way actually looks like word art with grunge and everything when it is much bigger than this. Thanks for the comments y'all have made for me in the last couple of days. Lots of love! I can't wait to get a peek at your album, that's going to cost a fortune, LOL.